Grosvenor Casinos’ Goliath has struck again, breaking its own 2017 record for the largest live poker tournament outside of the USA. This year Grosvenor Casinos welcomed a staggering 7,584 runners to the £100+25 buy-in Goliath Main Event creating an unfathomable £758,400 prizepool, generating life changing cash prizes and all from a £100+25 buy-in. The record breaking Goliath returns to Grosvenor Casino Coventry in the Ricoh Arena from 26th July to 5th August 2018. Buy in at your local Grosvenor Casino Cardroom or online on Grosvenorpoker.com. Grosvenor Casinos is proud to announce the 2018 Goliath Main Event first prize is guaranteed at £100,000. The David vs Goliath competition was a chance for Grosvenor Casinos customers to win a prize package designed to help novice poker players learn all the tips and tricks they’d need to take on the £100,00 guaranteed Goliath Poker Tournament 2018. We asked any customer with ‘Dav’ in their forename or surname to comment on our Facebook page. From the entries we randomly selected 6 players to attend a poker boot camp taught by three of our Grosvenor-sponsored professionals at Grosvenor Casino Coventry. Joe Beevers, Jeff Kimber, and Katie Swift led the Rich Energy Boot Camp across two days. Check out some footage of our David vs Goliath winners in action in the video above. David vs Goliath 2019 is our biggest yet. We’ve searched far and wide for a challenger that can match the magnitude of Goliath. And we found someone… David Haye. World Champion boxer David ‘The Hayemaker’ Haye is in training to take on the biggest poker event outside of Las Vegas – the Grosvenor Casinos Goliath Poker Tournament 2019. 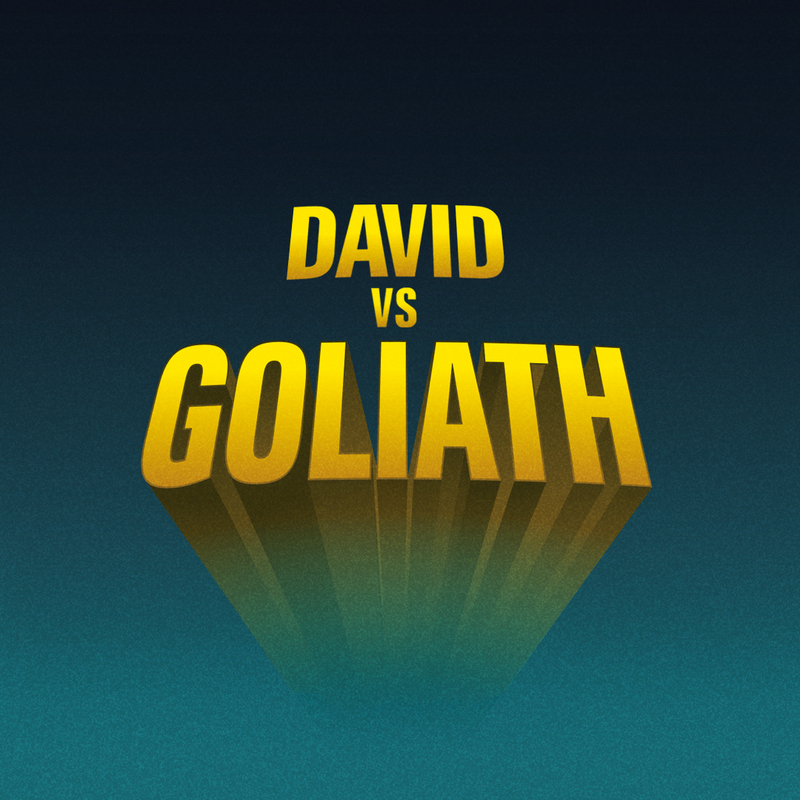 David vs Goliath is our latest competition for players with ‘Dav’ in their name to take on the giant that is Goliath! Six lucky winners (three women and three men) will win a two-day Boot Camp session to learn poker from professional poker players and compete in Goliath, the ultimate poker tournament, for a shot at the £100,000 guaranteed first prize. 1. 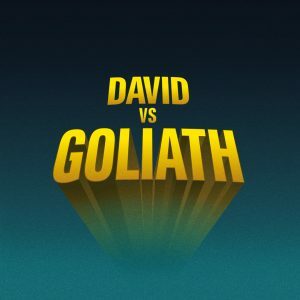 The David Vs Goliath Boot Camp competition will run from the Thursday 7th June at 8:00pm – Thursday 28th June at 5:00pm 2018. 2. Winners must be available on Thursday 26th to 28th July 2018, including 10am-7pm on the 26th and 27th July 2018. 3. Winners of this online competition will receive free entry to Goliath poker tournament on the 28th July, tuition from poker professionals, food and drink vouchers, £50 cash, £25 in casino and two nights of accommodation in the Hilton Hotel, (Judds Lane, Longford, Coventry, CV6 6AQ), This will be for the each of the 6 winners, it does not include additional guests. Further information is detailed below. 4. This promotion will be hosted on Grosvenor Poker’s Facebook page and there will be six winners chosen at random in gender categories. 3 men and 3 women will be chosen. 5. To enter the Boot Camp competition customers must comment ‘All in’ on the Facebook competition post (published on Thursday 7th June 2018). A comment on subsequent or previous posts will not qualify for the competition. 6. Only comments from customers who have some component of ‘Dav’ in their name will qualify i.e. Dave, Davina, Davidson etc. This is decided at Grosvenor Casino’s Central Office (grosvenorpoker.com) discretion. Proof of ID must be presented on arrival at the event. 7. Customers can only enter the competition once and will be disqualified if their comment appears more than once. 8. Winners will be notified through Facebook Messenger within a 48-hour period of the closing date (Thursday 28th June 2018). If the winner fails to answer back within 72 hours of receiving the initial Facebook message, they will be sent a gentle reminder. If there is no response from the customer within 48 hours of the second message Grosvenor Casinos will contact the participant informing them they have been removed from the competition. Grosvenor Casinos will then have the option to choose another participant from the comment section. 9. Winners will be sent a survey that will need to be completed within 3 working days of receipt. This includes questions on their dietary requirements, poker ability and understanding of poker. 10. All winners must be a member of Grosvenor Casinos. If winners are not already members they will be required to sign up at Reception on the day of the event. 11. The Boot Camp (Thursday 26th – Friday 27th July 2018) will be located in Ricoh Arena, Judds Lane, Longford, Coventry, CV6 6AQ within Grosvenor Casinos. 12. Grosvenor Casinos will book and arrange two nights of accommodation for all six competition winners at the Hilton Hotel, Judds Lane, Longford, Coventry, CV6 6AQ. This will be for the nights of 26th and 27th July 2018, check out is on 28th July at 11am. 13. All six winners will be given food tokens for breakfast, lunch and dinner for the event. Unlimited soft drinks will be accounted for. 14. Alcoholic beverages are not included in the Boot Camp package. Grosvenor Casinos is not responsible for any activity, accident or injury suffered by the winners under the influence of alcohol. 15. By agreeing to participate in the Boot Camp all winners will be offered the opportunity to be included in filmed press material. Inclusion can be decided on the day by signing consent forms. 16. The Boot Camp will be taught by professional poker players in a non-competitive environment and provide winners with the opportunity to play in competitive games at Goliath. Training will be conducted in a group format. No additional capital is needed from the competition winners unless they choose to play at their own leisure after the hours of the Boot Camp. 17. By entering this competition hosted by Grosvenor Casinos, the winner is agreeing to receive communications from Grosvenor Casinos as we may need to send their contact details via Facebook to arrange operations for the Boot Camp. You can opt out of these consents at any point by contacting a team member or the sender (Grosvenor Casinos and grosvenorpoker.com). 18. The winners will not be contacted through a third party unless it is to arrange accommodation for the proposed dates or any other logistic queries relating to the competition. 19. Grosvenor Casinos shall not be liable for loss or damage of any personal belongings during the event and at the accommodation (26th-28th July 2018) and shall not be liable for death or personal injury of any participants during the weekend. 20. Grosvenor Casino is not responsible for associated damages or injuries sustained in the provided accommodation or on the Grosvenor Casinos premises. 21. Grosvenor Casino is responsible for planning events for the winners between 10am and 7pm on the aforementioned event dates. Out of these hours winners are responsible for planning their own activities and are not obligated to stay in the casino. 22. It is prohibited for customers who have entered a professional poker tournament within the last 12 months (including GUKPT, 25/25, and Goliath) to enter the competition. This includes Grosvenor Casinos and any external poker brands. If this condition is violated we have the authority to remove the winner from the Boot Camp at our discretion. 23. The Promotion is subject to availability, legal restrictions and at the discretion of management and are available to over 18s only. 24. There is no cash or other alternative to the promotion in whole or in part. The offers are non-transferable. 25. The Promoter reserves the right to withdraw or change this offer at any time. 26. The terms highlighted are accompanied with all individual voucher terms and conditions. 27. The Promoter is the sole arbiter of this promotion and its decision is final and binding. No correspondence will be entered into. 28. Grosvenor Casinos employees are not eligible to participate in this promotion. 29. This promotion is not to be used in conjunction with any other offer. 30. The Promoter may alter or withdraw this promotion at any time for any reason and without prior notice. 31. This promotion is also subject to Grosvenor Casinos General Terms and Conditions.